Turquoise blue is the colour of a calm lake on a spring day. At the same time, there are elements of earth and air contained within it, in the form of brown, grey and cloud white inclusions. 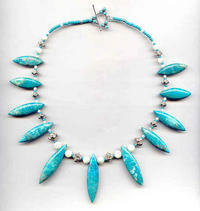 In my opinion, turquoise is the most well-rounded of all the opaque gemstones. In this collar necklace, graduated polished marquise-shaped turquoise pendants are spaced with glowing white mother of pearl and intricate sterling silver beads. I've spaced the larger beads with turquoise coloured glass seed beads, and closed the 18-inch strand with a sterling silver triangular toggle clasp that's set with turquoise cabochons. 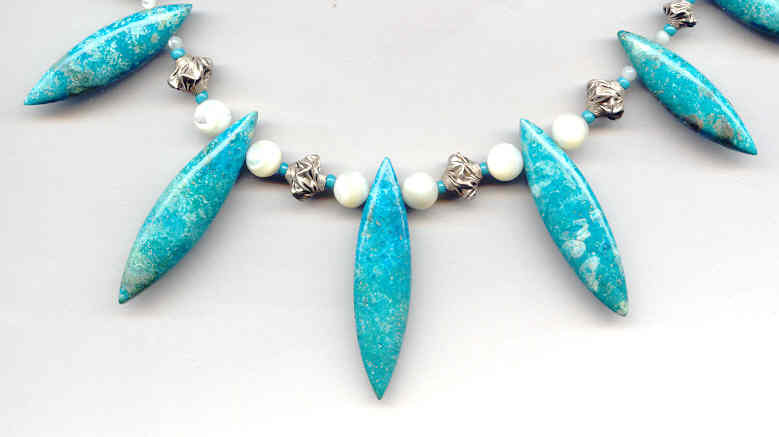 Naturally, this turquoise masterpiece is brought to you by SPARKLE PLENTY.